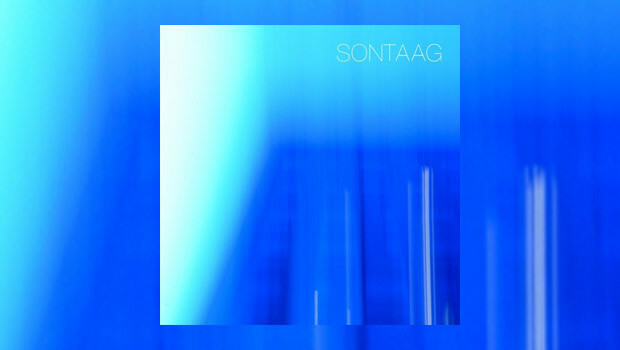 The self-titled début album from Sontaag is a concept piece that sees the core duo of Richard Sontaag (composition and instruments) and Ian Fortnam (words and voice) helped out here and there by drummer Milo Venter and singer Amanda Cross. “In the grand tradition of high concept progressive rock comes an epic transmedia hybrid. visceral rock ‘n’ roll; sonic cinema meets e-book pod-lit in cyberspace. To make such claims for what an unsuspecting audient is about to hear takes someone with balls the size of asteroids. Do the words engage and entice the prospective listener? Not in my case and a sense of foreboding filled me as I tentatively pressed ‘Play’. The result? Don’t believe the hype. Recorded over a couple of years by New Yorker Sontaag with U.K. rock journalist Fortnam and produced by Youth from Killing Joke – a man who really knows what he’s doing in a studio – the storyline for Sontaag is built on the premise that ‘The Ancients’ discovered the secret of synthesizing essential energy from harmonic sound, giving them the power to reanimate extinct planets by using giant orbiting sonic generators, the inhabitants of these planets are then compelled to provide the musical fuel for these sonic generators just to stay alive. But the album itself just does not deliver. Of the 13 tracks, 10 feature narration of the storyline by Fortnam, embedded into the pieces rather than separated which has the effect of emasculating any direction that the music may take. Only a quarter of the tracks not featuring narration? That’s not an album, in my book that’s a, er, book. The amount of narration is excessive to say the least; it would make sense for the story to be laid out in the CD booklet with only key elements being incorporated into the album itself in order to aid the flow of the music. So will someone please explain to me why the CD packaging contains barely a word of the copious narration that we have to listen to throughout Sontaag? The whole of the plot is contained within the hour or so of the album which is almost certain to make Sontaag a very short-term proposition as it is so spoken word heavy that even the most ardent fan is sure to get bored with it, and as the storyline is woven into the framework of most of the tracks there’s no way to skip it. Of the tracks without a narrated section only two are standalone songs, Fortnam providing the vocals, both of which incorporate a style that doesn’t fit the rest of the album. We have the pure Hawkwind of Spaceshifter which is quite fun but due to its cartoonish spacerock attitude it seems misjudged and downgrades the concept. The vocals are OK and the soloing is adequate without having the necessary quality to lift proceedings. The same can be said of the punky hard rock of Interstellar Genocide – “Pucker Up and kiss the Apocalypse!” No thanks…. Both feel out of kilter with the rest of the pieces, the only really rocking moments on an album of pretty aimless noodling and undulating ethereal textures. Neither is a good fit as those who like the energy won’t be satisfied with the rest of the album and vice versa. The instrumental Empyrean acts as an overture for the album, setting the scene with an ethereal drone leading into Floydian guitar which is pleasant enough but lacking the dynamic flair of a Dave Gilmour. The drums kick in and the result is good without being overly impressive, driving the pace along nicely until keys take over for an orchestral climax which fades back to the ethereal to lead into The Great Harmodulator and the first dose of narration, delivered in Fortnam’s South East of England tones, against a backdrop of sweeping keys. The effect is more Hitch-Hikers Guide to the Galaxy (but without the wit) than War of the Worlds, any gravitas replaced by a tongue-in-cheek flippancy that lets the story down somewhat. Booming Shakespeareanism is not required either but, for me, the narration is not pitched at the right level and leaves the whole thing flat and somewhat pointless, tainting the music. It is all quite odd and as things progress you can’t help but feel that it turns the whole thing into a knockabout tale of interplanetary apocalypse rather than a truly entertaining literary work; just a bit of fluff that tries to add more weight to a pretty but inconsequential series of instrumental doodlings. Narration features to some degree on every other track but much of it is lost to the listener. From early on deciphering the words is made difficult by the bubbling stew of keys and guitars that surround them, the different layers of aimless noodling sitting at odds with each other. By around track 9, Chokuto, it becomes almost impossible to figure out what the hell is going on, the words becoming more and more subsumed into the surrounding marsh of squally guitars and pulsing keys, and much of the story is lost. Or maybe I’ve just stopped listening or caring. Either way, by this point I don’t feel that I am missing much. There is a widescreen feel to proceedings but it does not have the sweep of a truly cinematic experience and some of the tracks are too jarring for the album to work in a satisfying arc from start to finish. Of more note is Serena Seranarum with a suitably celestial vocal from Amanda Cross which is certainly worthy of being heard properly but is undermined by the embedded narration which does nothing for the overall impact of the music, the setting for which is good but not great, the track being something of a curate’s egg; there is something lacking. Glissandor is one of the better tracks, a funky drumbeat is the bedrock for plucked acoustic guitars and glockenspiel melodies interspersed with sweeping electric guitar solos. It’s good but once more the words appear to wreck the mood. The same fate befalls the widescreen Aftershock and it’s now all just so much hot air as the ‘hero’ – a musical genius by the name of Sontaag in another startlingly egotistical display – makes a decision with disastrous repercussions for his home planet. “Epic fail, Mr. Sontaag!”, you can almost hear the listeners cry, both in terms of the story and the album. And so to the ‘finale’, Memoria Tenere, which at nearly 10 minutes must be good, right? The Floyd feel is there at the start as it seems to be recapitulating some themes from earlier. The solo here is strident and well supported. Not bad, just not great. Then more bloody words and I’m getting annoyed now. What is this album about, the words or the music, as each element just gets in the way of the other? Confused and built into something that it isn’t, they should have called the album ‘The Emperor’s New Clothes’ and be done with it as underneath all the hyperbole and egotistical expectation building Sontaag and Fortnam, if not completely naked, are standing before us in their threadbare pants. The track goes on and on without a real theme, purpose or any excitement then just fades out – before fading back in for more of the same with added Hawkwindian pulsing. It lilts and drifts for a few more minutes before petering out for good. With one or two exceptions the music simply acts as a link between the spoken elements of the story and is not powerful enough to properly stand on its own; just so much sonic wallpaper. There are more questions than answers when considering Sontaag; if you’ve set out to make an epic concept album to rank with the best ever, this is not how I’d have gone about it. Sontaag and Fortnam have set themselves up for a fall from the off by building this release into something it just plain isn’t and had they released it with less fanfare there would be less expectation. Youth’s production is as impressive as you’d expect from a man with his track record but overall it just completes the effect that the album is all just so much over-inflated bluster. You really can’t polish a turd. The story is left open so no doubt there will be a sequel but I hope that Sontaag and Fortnam will sit back and consider how best to get their collaboration across to any potential audience. This début is not completely without merit but is deeply flawed. and it is a shame that Esoteric Antenna have fired a bit of a blank here as they usually have a knack for producing interesting and entertaining new releases. It no doubt sounded great during the pitch but the substance is lacking to the point of near-invisibility. Built up out of all proportion before even being heard, this was always likely to be a disappointment. A more measured approach may have given it a fairer run as there are indeed some nice moments but ultimately this album is one that you may moderately enjoy in passing once or twice but I just can’t see it having the legs to become a regular feature on anyone’s playlist.